XM:A is an example of a talented filmmaker sleepwalking through making a film. Vastly inferior to his previous X-film, Days of Future Past, director Bryan Singer has a created a film with such impossible ridiculous stakes, that audience by-in is unfathomable. 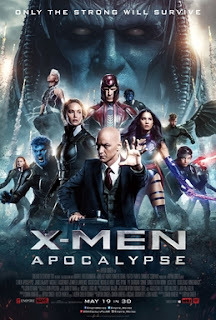 Re-introducing characters established in the original X-men as teenagers in the 80’s is an interesting choice, undermined by the use of Apocalypse as the film’s big bad. Apocalypse as played by Oscar Isaac, is a portentous blowhard that can absorb and use any mutant power, begging the question why he needs to recruit any other mutant. Angel, Storm & l Magneto are brought into the fold, to reap vast swaths of global destruction, including an incredibly disrespectful sequence where Magneto, inspired by Apocalypse, destroys Auschwitz. Jennifer Lawrence joins Michael Fassbender in looking bored to tears as they work through the last movie of their deal. James McAvoy tries his hardest while spending most of the movie doing nothing and even a Hugh Jackman cameo as Weapon X does little to spice up the films bloated running time. Ponderous and boring, XM:A dutifully trudges through plot towards its climax, never building to anything exciting or meaningful, and burdened with sub-par VFX, particularly in the opening sequences. With Jackman retiring from Wolverine with his next (and last) solo outing, XM:A unintentionally makes a good argument for this X-men universe to actually end.